Since we launched QualityTime in January this year, we have had an overwhelming response, seen the app written about internationally, integrated with IFTTT technology and due to popular demand and launched a 2.0 version! 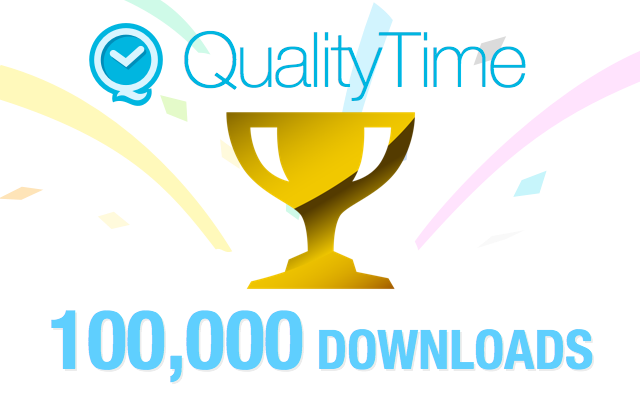 We are now delighted to announce that QualityTime has hit the 100,000 downloads milestone, and want to thank each and every one of you for your support. Your feedback has helped us to develop the app, and it would not be the same without you. 100,000 downloads means hundreds of thousands of hours saved using QualityTime, and we would love to hear about how you have spent your QualityTime. Please get in touch with us at support@zerodesktop.com, and let us know what you have done with time previously spent on your smartphone. We love hearing how the app has helped you make time for things you love, and manage your digital diet in a way that works for you. At Zero Desktop we look at different ways Cloud Computing can be used to help you, so we are also excited to announce that we will be launching a new app soon! Watch this space for more information, and as always we will let you know first. Over 1,000,000 Users Have Downloaded Quality Time!